Hi Everyone! This is Melanie from Artzy Creations and I’m so thrilled to be here today with The 36th Avenue. 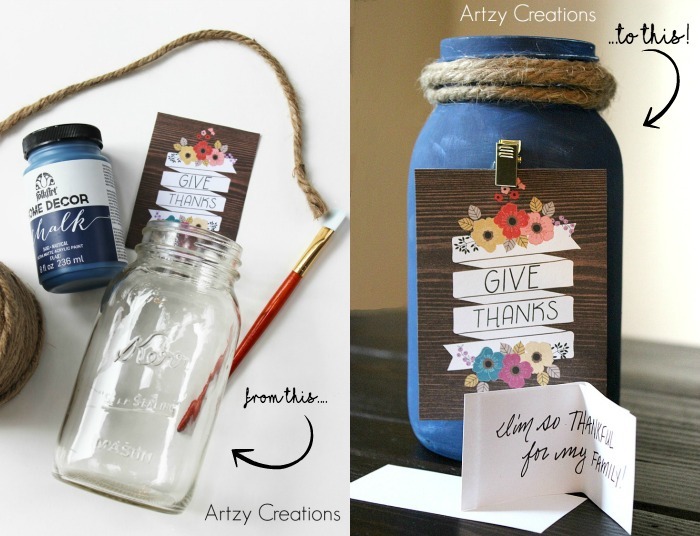 Today, I have a very simple and cute Thanksgiving Project, since it’s right around the corner. 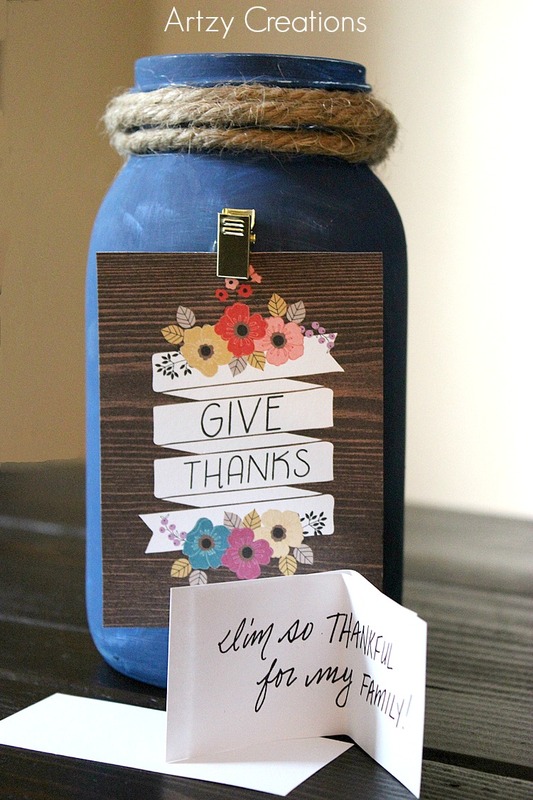 I’m sharing with you, this Give Thanks Jar for Thanksgiving. This is a new tradition we are starting this year in our household. We are going to have all of our family and friends write down on a little sheet of paper a couple of things they are thankful for this Thanksgiving. We are then going to pass around the jar and take turns sharing everyone’s little sheet of paper of what they are truly thankful for this season. I just know it will be a hit, and become our newest tradition. Step 1: Paint the Mason jar with the white chalk paint a couple of times and let it dry. 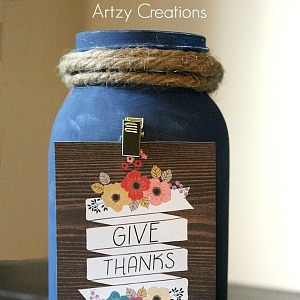 Step 2: Paint a few layers of the blue paint onto the Mason jar. Let it dry. Step 3: Take a piece of sandpaper and lightly distress the Mason jar. Step 4: Hot glue some twine to the top of the jar making sure the unfinished ends are to the back of the jar. Step 5: Hot glue the clip to the jar. Attach the piece of scrapbook paper with the Give Thanks on it or create your own. There you have it! Fun, easy and meaningful. I know I am really looking forward to this Thanksgiving to try something new! This would also make a cute vase for some flowers after Thanksgiving. A big thanks to Desiree for having me! I wish you and your family a wonderful Thanksgiving!